City of York Council would like to hear your views on proposals to introduce a new Clean Air Zone (CAZ) for the part of York within and including the inner ring road. Unlike other parts of the country, where a Clean Air Zone is a mandatory requirement, City of York Council is proactively looking to introduce a Clean Air Zone. This will help to reduce the amount of traffic pollution in York’s city centre, mainly caused by diesel vehicles. The council is looking at many ways to improve air quality in the city centre. One of these options is by working with bus operators to apply the proposed Clean Air Zone to local bus services. The evidence gathered through York’s Third Air Quality Action Plan shows that local bus services make up 3% of the traffic, but cause 27% of the pollution in York. By limiting the numbers of worst-polluting diesel buses travelling through the Clean Air Zone, pollution can be reduced, thus achieving air quality and health benefits. 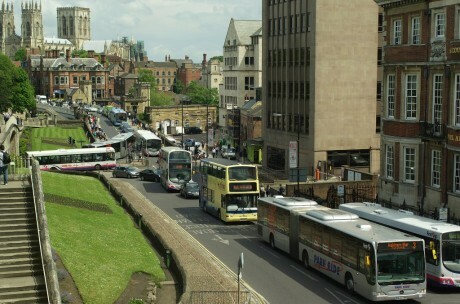 The council understands that the city’s local bus services play a vital role in bringing people into York to work, shop or enjoy the many visitor attractions and amenities, so it’s important that you provide views on these proposed changes through the survey. The consultation is open until midnight on Friday 3rd August 2018.